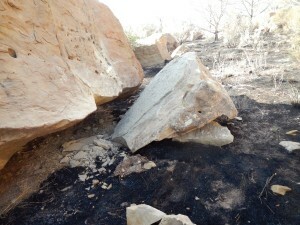 The source of the July 2012 Lighthouse Fire in Range Creek, Emery County, Utah, was where a falling boulder (near center) hit a large stationary rock (on left) and the resulting friction ignited the surrounding dry brush. Photo courtesy of Jason Curry (Utah Division of Forestry, Fire, and State Lands). During the onslaught of wildfires in Utah and surrounding states in the summer of 2012, the Utah Geological Survey received a question about whether rockfalls were a legitimate cause of wildfires or just a tall tale told to explain fires of unknown origin. If you look at wildfire statistics, causes are typically broken down into two main categories: human-caused or lightning. However, various publications and websites claim four major natural causes of wildfires: lightning, volcanoes, spontaneous combustion of organic material, and rockfalls. Rockfall-ignited fires, which are difficult to identify, make up a tiny fraction of total wildfires. In an article published in 2000 titled Synopses of Wildfires Caused by Rockfalls, Richard T. Ford (retired division chief of the California Department of Forestry and Fire Protection) makes the case that although rare, blazes of this origin do exist. He cites a study by geologist Richard F. Madole and physicist Dr. Joe Romig indicating that the abrasive friction between rocks scraping against each other at a certain velocity can reach ignition temperatures without a spark. 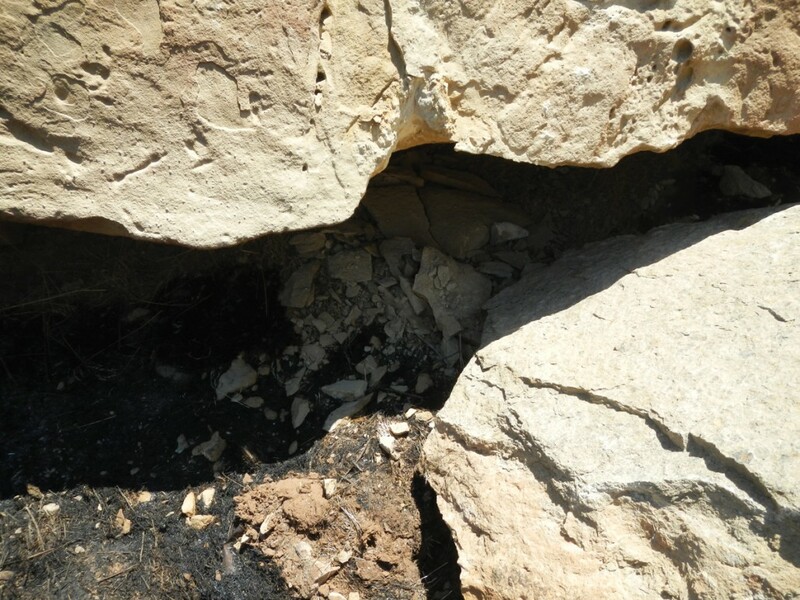 Evidence—such as charred and burned grass imbedded on the rock face where fire originated, eye witness accounts, or ruling out of other factors (e.g., being in an area with rare lightning occurrence)—was used in deducing the ignition source. One-tenth of a percent of all Utah’s wildfires are estimated to be the result of rockfalls according to Jason Curry, fire investigator for the Utah Division of Forestry, Fire, and State Lands. In his five years as a fire investigator, he has seen only one example, referred to as the Lighthouse Fire that took place in Range Creek, Emery County, Utah, on July 18, 2012 (see Deseret News article http://tinyurl.com/bvhfekn). University of Utah archeology students and staff had been excavating a Fremont Indian site when the fire was spotted. A thorough investigation eliminated all other possible incendiaries, and, in conclusion, Curry designated rockfall as the cause. Now that Curry has seen first-hand evidence of this type of wildfire, he is considering revisiting previous wildfires of unknown origin to determine if rockfalls could have been responsible. Although rare and difficult to identify, rockfalls do indeed trigger wildfires. The next time you find yourself bulldozing large rocks at the top of a steep slope, or tossing rocks with your Boy Scout troop, beware of the possibility of starting a wildfire!